We traveled back roads through the country, our car slowly crawling over gravel. Once we reached the trail head that would take us to this hidden gem, we started our hour long hike through a winding trail. It was grown over just enough that I needed my walking stick to clear our path ahead, and so narrow we could only walk single file. Occasionally the path was only wide enough for a foot to step across with steep declines to our left and inclines to our right. After a fork in the trail, and around a small creek, we came out onto this open space that was an amazing mecca of color and stone sculpture. The long sandstone formation is appropriately named ‘Devil’s Backbone’. 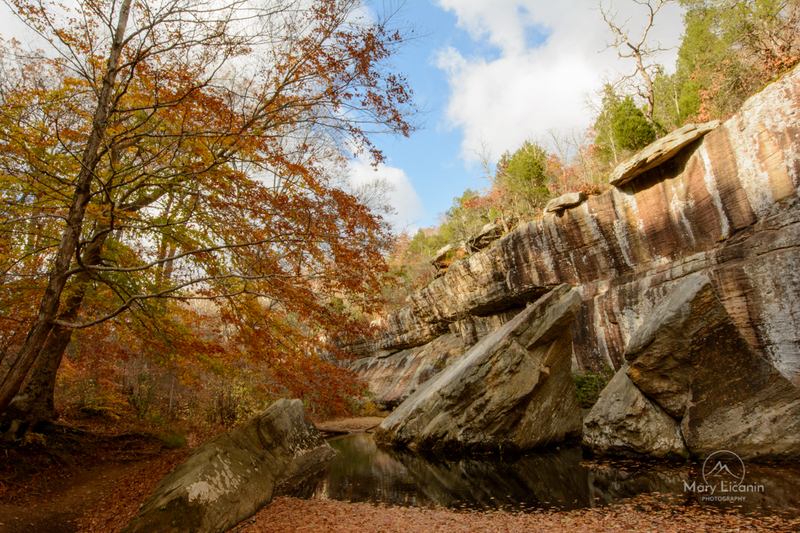 Devil’s Backbone is found in the Bell Smith Springs area of the Shawnee National Forest and is a moderately difficult hike with 8 miles of interconnected trails. A gorgeous place for hiking and spotting local flora and fauna, but most notable are it’s rock formations, scenic overlooks and hidden springs.